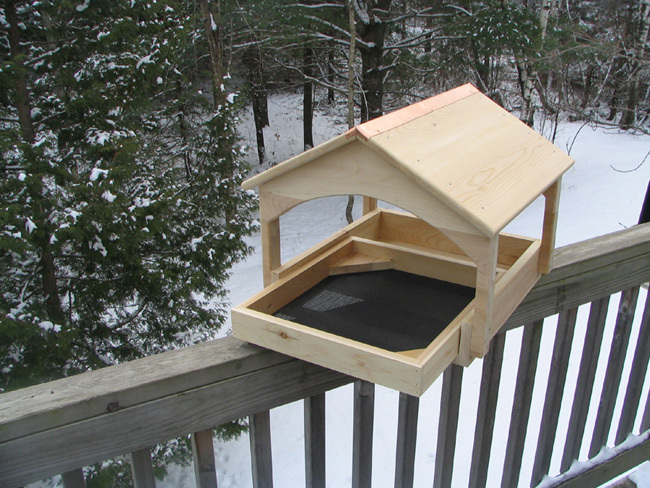 The covered platform feeder measures 17" x 17 1/2" x 20". It has a 16 3/4 x 15 x 2 5/8 inch pull out tray for seeds with one layer of 1/4 x 1/4 inch screen and a second layer of screening. It has uprights to support a peaked roof caped with copper. They come complete with a 1 1/4 in. pipe flange adapter bolted to the base for mounting. Pipe not supplied.